Business Expanded by 17.67% Y-O-Y. CASA Portfolio increased by Rs.538.26 crore, Y-O-Y. Operating Profit decreased by 6.82%, Y-O-Y. Net Interest Income (NII) recorded growth of 20.78%, Y-O-Y. Lakshmi Vilas Bank (LVB), a private sector Bank in its transformational journey, has reported its third quarter results today. The prevailing difficult environment has had its impact on the numbers as indicated below. Total Business of the bank reached Rs. 55,850.69 crore as of 31/12/2017, showing an increase of 17.67%, Y-o-Y. Gross Advances increased from Rs. 19,713.57 crore to Rs. 25,230.64 crore registering Y-O-Y growth of 27.99%. Total Deposits rose from Rs. 27,750.59 crore as on 31/12/2016 to Rs. 30,620.05 crore as on 31/12/2017, registering Y-o-Y growth of 10.34%. CASA grew from `5,943.49 crore to Rs. 6,481.75 crore, registering Y-o-Y growth of 9.06%. CASA as a percentage to deposits stood at 21.17% from 21.42% a year ago. · Core Operating Profit (Excl.trading profit) for the nine months period has increased by 28.57% (from Rs. 253.83 crore to Rs. 326.33 crore). · However on account of trading loss, Operating Profit for the nine months period is lower by 6.82% (from Rs. 455.70 crore to Rs. 424.62 crore) and Net profit stood at Rs.37.38 crore. Net Interest Income (NII) for the nine months period recorded a growth of Rs. 115.29 crore (20.78%) from Rs. 554.84 crore to Rs. 670.13 crore, Y-o-Y. Net Interest Margin (NIM) of the bank stood at 2.77% as of 31st December 2017 as against 2.77% as of 31st December 2016. However on account of trading loss, Operating Profit for the quarter is lower by 73.10% (from Rs. 171.45 crore to Rs. 46.12 crore), resulting in net loss of Rs.39.23 crore. Net Interest Income (NII) for the quarter recorded a growth of Rs. 29.05 crore (15.24%) from Rs. 190.62 crore to Rs. 219.67 crore. Net Interest Margin (NIM) of the bank for the quarter ended Dec’17 stood at 2.63% as against 2.72% for the quarter ended Dec’16. Total deposits as of 31.12.2017 stood at Rs. 30620.05 crore, registered a growth of 10.34% over 31.12.2016. CASA deposits have grown by 9.06% (Rs. 538.26 crore) over the previous period and stood at Rs. 6,481.75 crore. Term deposits stood at Rs. 24,137.07 crore, while CASA proportion to total deposits stood at 21.17% as on 31.12.2017. Gross Advances as of 31.12.2017 stood at Rs. 25,230.64 crore, registered an increase of 27.99% over previous period. The Bank’s total Capital Adequacy Ratio (CAR) as per Basel III guidelines, was at 9.75% as at December 31, 2017 as against 10.21% as at December 31, 2016. The Bank vide its letter of offer dated 27.11.2017 offered up to 6,44,97,155 Equity Shares of Face Value Rs.10/-each at a price of Rs.122 per Equity Share (including a share premium of Rs.112 per Equity Share) for an amount aggregating to Rs.786.87 crore to the Existing Equity Shareholders of the bank on a rights basis in the ratio of one Equity Share for three Equity Shares held by the Equity Shareholders on the record date i.e. 06.12.2017. The Bank has alloted 6,39,87,006 equity shares on 03/01/2018, the remaining 5,10,149 Equity shares being kept in abeyance. Consequently, the capital adequacy ratio would improve accordingly. As on 31.12.2017, Bank has 519 branches, 7 Extension Counters, 981 ATMs in 16 states and 1 union territory, the Bank offers various bouquets of products and services. The Bank is committed to build a sustainable business over the long term and upholding high standards of customer service - Life Smiles Where Lvb Serves. The Board of Directors of The Lakshmi Vilas Bank Limited approved the unaudited financial results for the quarter/nine months ended December 31, 2017 at their meeting held in Chennai on 30th January, 2018. 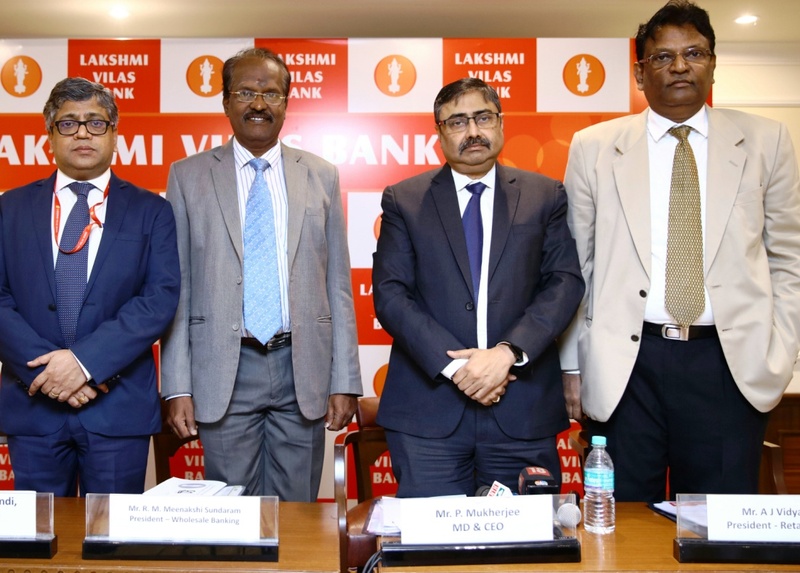 Lakshmi Vilas Bank was founded in 1926 and it has a national presence serving over 2 million customer accounts through its 523 branches, with PAN India presence, supervised by 11 Regional Offices, 7 Extension Counters and 984 ATMs in 16 States and Union Territory of Pondicherry. The Bank is active across the entire spectrum of customer segments - retail, mid-market and corporate. Through its branches, the Bank also offers a host of para-banking products in association with Life, General and Health Insurance companies, mutual funds, stock broking houses, money remittance companies, etc. on a technologically advanced platform.